‘This place ain’t big enough for the two of us’ – what happens at the boundaries of estates? My final contribution to the series of blogs on Welsh estate maps focuses on the theme of boundaries. As previously discussed, ownership of land was a crucial part of the Welsh gentry’s claims to status, honour and authority. These connections between land and power often led to strong assertions of territoriality from estate owners and provided a major impetus for the production of estate maps: records which visually asserted the location, extent and composition of an individual’s domains. The vast majority of estate maps were commissioned to show the lands belonging a single estate. Typically, little or no detail is shown for land not owned by the individual commissioning the map. They do however often give an indication of who owned the adjacent lands, inscribing the names of neighbouring landowners at the margins of the territories marked on the map. This was especially the case if the estate in question was not consolidated, but rather a patchwork of lands intermixed with the landholdings of other estates. The question I want to explore in this blog is what happened at the boundaries of two estates? Boundaries were often marked in the landscape by physical features such as trees, rivers, hedgerows, walls and ditches. There are also many examples in Wales of boundary stones marking out the limits of an estate in a landscape, such as in the Black Mountains, Breconshire, which features a line of early-19th century stones demarcating the lands of the Macnamaras of Llangoed Hall . In some places, there was also a tradition of ‘beating the bounds’, which involved groups of local people walking around the boundaries of a manor or parish, thereby inscribing the limits into the memory of the local populace. Despite these attempts to sure up boundaries, they were regularly the subject of disputes, which could often lead to law cases. In the National Library of Wales there is a map which focuses on the boundaries of two estates situated around a stretch of Afon Cothi in the parish of Cynwyl Gaeo, Carmarthenshire. 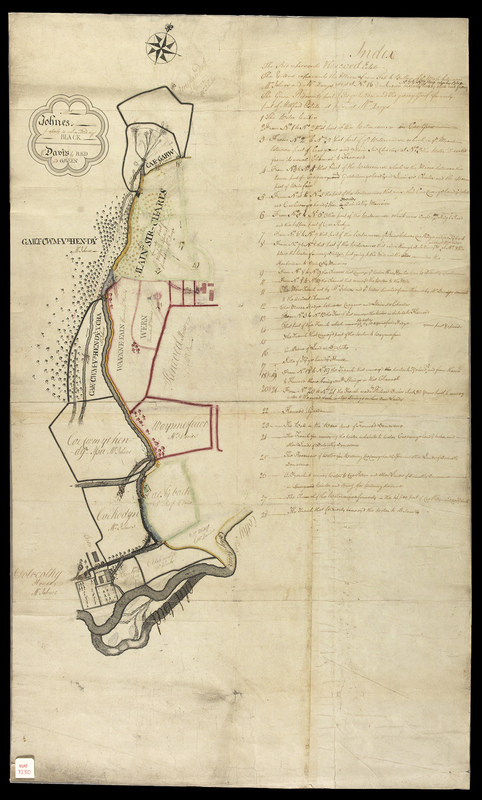 The map appears to have been produced in response to a lawsuit filed in the Court of Great Sessions in 1778 by John Johnes, the squire of Dolaucothi, against William Davys of Kencoed (Cefn-Coed Mawr) relating to ‘the watercourse’ (Eaton Evans & Williams Solicitors Records, 3281, 7469). The map signals an attempt to differentiate between the two estates, with Mr. Johnes’ lands outlined in black and Mr. Davys’ in red and green (the lands in green having been recently acquired by Mr. Davys, previously forming part of the Millfield / Maesyfelin estate). The map shows the proximity of the two houses and though the Dolaucothi mansion was clearly the more eminent structure (surrounded by formal gardens and outbuildings including a barn and mill), the map gives the impression that Kencoed was too close for comfort. The two estates were interfering with one another’s territorial assertions. A yellow line on the map marks the boundary between the two estates, which for the most part follows the course of the river, though there are two small areas, marked in blue, which are referred to as ‘unknown property’. The lands adjoining the river are marked with 28 numbers, which relate to written notes and explanations on the side of the map. What becomes clear from these notes is that both estates had been making extensive use of the watercourse as part of their schemes of land and resource management. Two of the notes refer to ‘the water diverted from its usual channel to Kencoed’ and ‘the trench made by Richard Davies about 30 years past to convey water to Kencoed’; whereas reference is also made to ‘the reservoir of water for watering Cae-cwm-yr-hen-d? Issa and other lands of Dolecothy demesne’ and ‘a trench to convey water to Cae Rodyn & other lands of Dolecothy demesne in winter and spring for watering the same’. – ‘A trench that formerly conveyed the water to Dolecothy’. However, the schemes were incompatible, leading to a dispute over the water resources. One of the notes mentions ‘the new trench cut by Mr. Johnes and ye water diverted from thence by Mr. Davys’ servants to the ancient channel’; and others refer to ‘the trench that conveys the water in dispute to Kencoed’ and ‘the trench for conveying the water in dispute to water Cae-cwm-yr-hen-d? Issa and other lands at Dolecothy demesne.’ In addition to the dispute over the water, the various schemes which had necessitated the redirection of the watercourse had moved, or at least complicated, the boundary between the two estates, one of the notes referring to ‘the piece of land in dispute’. The outcome of the Great Sessions case is unknown, though the map gives the impression that the area was unable to sustain the pretentions of the two neighbouring estates. It is perhaps of little surprise that Kencoed and its surrounding lands were purchased by the Dolaucothi estate in 1856 (Dolaucothi Estate Records, 179). The proximity of Kencoed, plus the competition it provided over use of the watercourse, would have provided a significant driver for consolidation, swallowing up the lands to bring them fully into the Dolaucothi ambit of authority. Over the forthcoming months and years the Institute for the Study of Welsh Estates plans to promote further research into Wales’ collections of estate maps. To keep up to date with our work, news and events, please email iswe@bangor.ac.uk to subscribe to our mailing list.